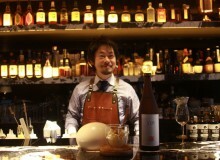 It’s a family affair in Tokyo, with sister bars LB6 and LB8 offering an intimate, upscale late-night experience in the Roppongi and Daikanyama neighborhoods. LB standing for La Bohème, both LB6 & LB8 were envisioned as a fresh take on the concept. Formally opened in June of 2012, LB6 lies just a block away from Tokyo Midtown, its name deriving from the kanji for Roppongi which means six trees. From the outside, LB6 looks as though it was plucked straight out of a steampunk novel. 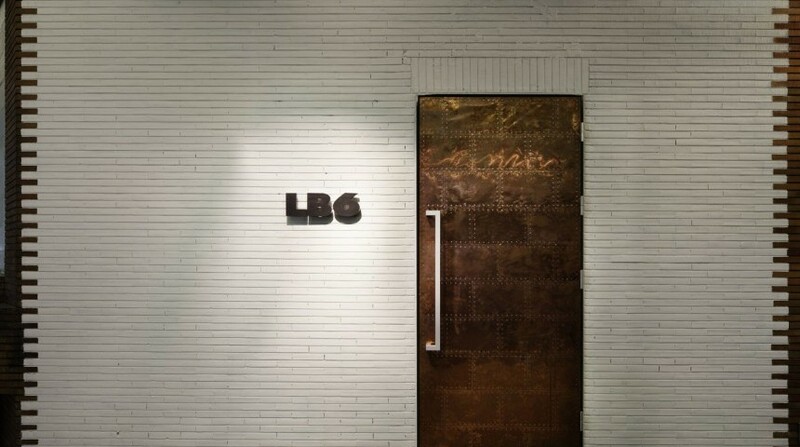 A single crisp bronze door lies against a white brick wall, an intriguing stylistic choice to say the least. Once inside, the tone changes considerably — but not so much that the steampunk fantasy is shattered. 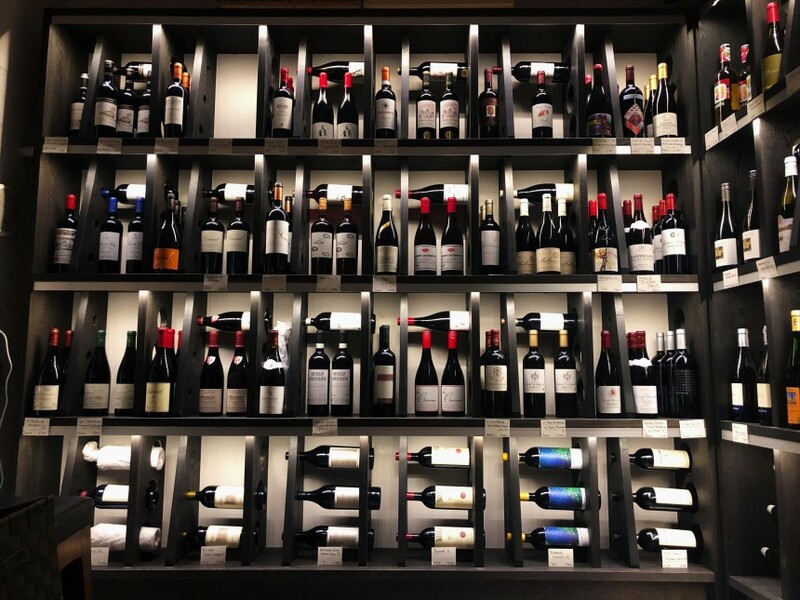 Rows of wine from over a dozen countries line the back of the bar in mahogany-colored shelves. The bottles have been meticulously arranged, with a single shelf showcasing the staff’s recommendations. Zinfandel Old Vine 2016, a red wine, currently holds the number one spot. The staff at LB6 are all very knowledgeable about wine, a trait they’re more than happy to showcase for customers whether they be first timers or self-proclaimed “wine aunts.” What the bar lacks in space, it makes up for with character and warmth that can only be achieved with such a small spot. Its food menu is smaller than that of LB8, but don’t let that deter you from making a visit. 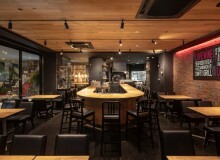 The open kitchen dissolves any barrier that would otherwise be erected in a normal bar, allowing customers to relax in the organized chaos of Tokyo. The wine selection is what really sets LB6 apart from its younger sister — everything from pinot noir, to chardonnay and rosé is available. Heavy hitters such as Moët and Dom Perignon can also be procured, but it’s safe to say everything on the menu is worth a try. For those that don’t fancy wine, LB6 also offers a fine selection of cocktails such as mojitos, veritas and the specialized moscow mule with homemade ginger ale. Those looking for a good meal in addition to good wine need only head southwest to Daikanyama, where LB8 resides. There used to be an LB7, but it’s no longer with us, so the 8 holds no significance other than continuing the numerical order. 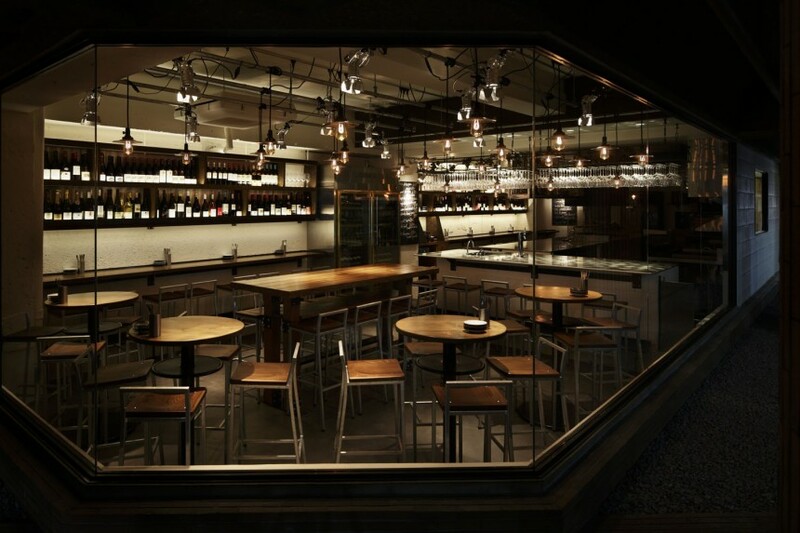 That aside, LB8 opened in September of 2013, expanding on the success of its sister. A far cry from steampunk, LB8 sports a much softer, modern style. The main doors swing open, giving the place a Malibu beach house feel in the warmer months. It shares similarities with its younger sister, such as the open kitchen and shelves of wine on display. What it has in abundance is space — a walk to the end of the hall reveals a staircase, the next level hosting a large dining area with booths and even a walk-in wine cellar at the back. Books are scattered throughout both floors of the bar, giving it a somewhat quaint aura that blends surprisingly well with the rest of the decor. Capitalizing on the additional space, LB8’s food menu dwarfs that of its younger sister. Pasta, salads, mashed potatoes, sirloin steak and more make for an exciting menu with an already impressive wine selection. Items are nothing short of creative, the candy foie gras arguably being the most interesting out of the entire menu. The presentation places the candy on matte black blocks, which somehow transforms them from Harajuku street food to refined delicacies — it works. Another specialty of LB8 is the bacon cheddar milk biscuits with maple butter. They’re far from glamorous, but the flavor makes up for that and then some. These are great when paired with a glass of sauvignon blanc, their status as a specialty item rightfully earned. Regular appetizers are split into hot and cold sections, non-specialty standouts being the pate de campagne and buffalo chicken wings. Those in the market for a healthier option will be pleased with the salad selection, my personal favorite being the recently added chopped salad with grilled salmon. All of this, however, pales in comparison to the crown jewel of LB8: its charcoal grill. Dishes are prepared with fresh seasonal fish and vegetables to provide an exquisite burst of flavor. Each dish is grilled upon order, taking about 30 minutes to complete. 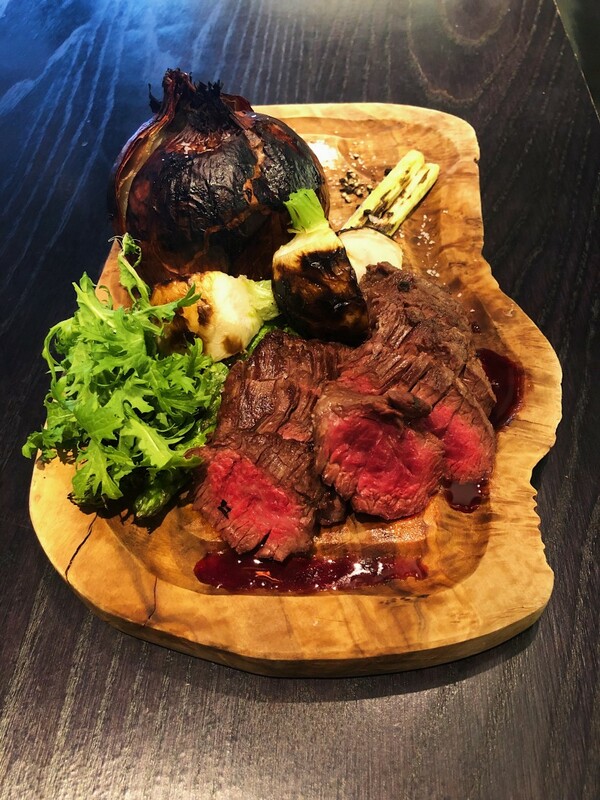 The final products are well worth the preparation time, the grilled US prime and homemade dry-aged beef steak acting as stellar examples. Those in search of a full meal with space to accompany a large group should look no further than LB8. 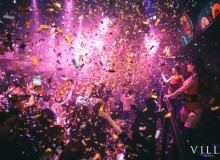 On the contrary, those that are seeking a more exclusive bar to top off their dinner will feel right at home with LB6. Regardless of which LB you go to, both provide an unforgettable experience in atmosphere and taste. Austin Freeman is an African-American living in Tokyo. His work encompasses many topics including but not limited to food, Japanese (pop) culture and sociopolitical issues. He enjoys photography and James Patterson novels.